1 roll of store bought puff pastry. Pre-heat oven to 180 degrees. Slice the red onion into even slices and place in a pan with a little oil on a medium heat. Cook down until the onions start to shrink and release their natural juice. Sprinkle over the sugar and stir. Reduce the heat and continue to cook but make sure to not let the sugar burn. Can take up to 20mins. Add the balsamic vinegar and some salt and pepper. Cook for a further 3 to 4 mins. The onions should be very soft but still have a slight crunch and a tangy sweetness from the sugar and vinegar. If it’s too sweet, add a little more vinegar or too tart, another sprinkle of sugar. Unroll the puff pastry and place on a parchment lined baking tray. Fold over the edges to create an outer crust when baking. Brush the crust with eggwash and place in the oven to par bake. After about 15 mins when the pastry has begun to rise and form its shape, remove from oven and carefully spread the caramelized onion over the base. The dough will be fragile at this stage so do this as gently as possible. It doesn’t need to be completely even. Return to oven and bake for a further 8 to 10 mins. Remove when ready and cool slightly. When it has cooled slightly, begin to assemble. 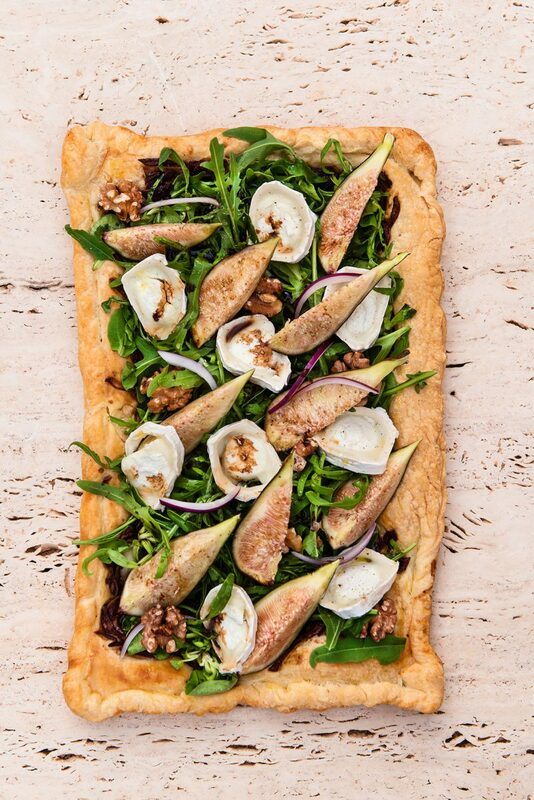 Scatter generously with rocket leaves, Arrange the figs and goats cheese on top and scatter over some chopped, toasted walnuts. Drizzle with balsamic vinegar and olive oil and serve.